Skin & Hair/Revitalizing Condition: For skin, hair and scalp in need of a conditioning moisturizer. Solution: Natural Coconut Oil is rich in skin-friendly saturated fats, making it perfect for use on all complexions. This unique oil goes on smooth to leave skin feeling silky and refreshed. It also serves as a natural alternative to chemically formulated commercial moisturizers, oils and scalp conditioners. NOW® Natural Coconut Oil is made by mechanical extraction of the coconut fruit and then deodorized. 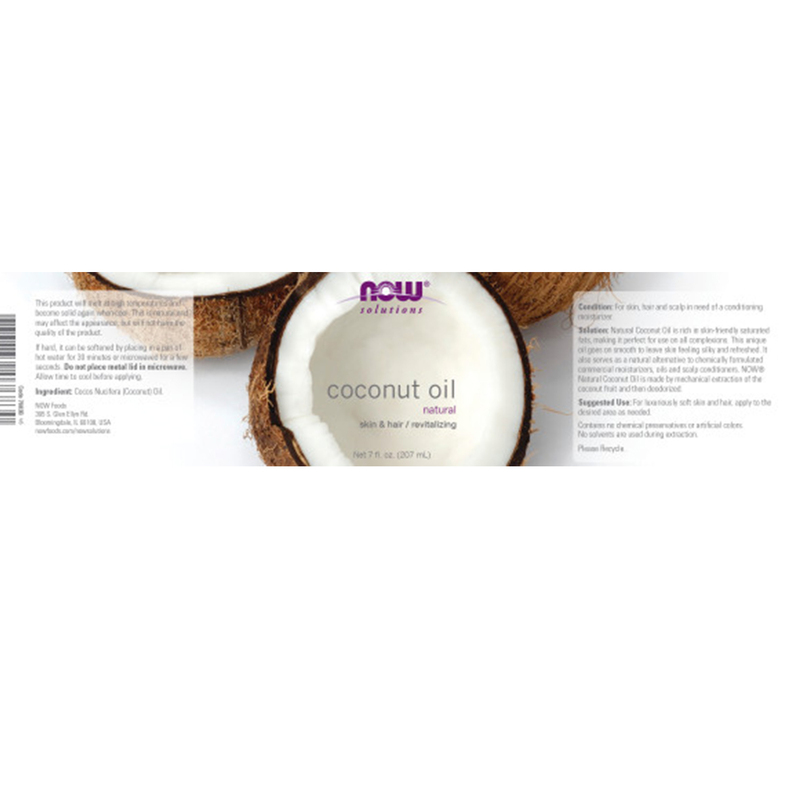 Ingredient: Cocos Nucifera (Coconut) Oil. NOW® Natural Coconut Oil is considered food grade. Contains no chemical preservatives or artificial colors. No solvents are used during extraction. For luxuriously soft skin and hair, apply to the desired area as needed. This product will melt at high temperatures and become solid again when cool. This is natural and may affect the appearance, but will not harm the quality of the product. If hard, it can be softened by placing in a pan of hot water for 30 minutes or microwaved for a few seconds. Do not place metal lid in microwave. Allow time to cool before applying.